We’ve all seen disgruntled employees. They’re unmotivated, decline to join in on team activities, and don’t seem to respect the company much. Perhaps they’re amazing at what they do, or maybe the company can’t afford to lose the employee. Often, a passionate employee loses some of their gusto, suddenly becoming a disgruntled employee who is difficult to deal with. 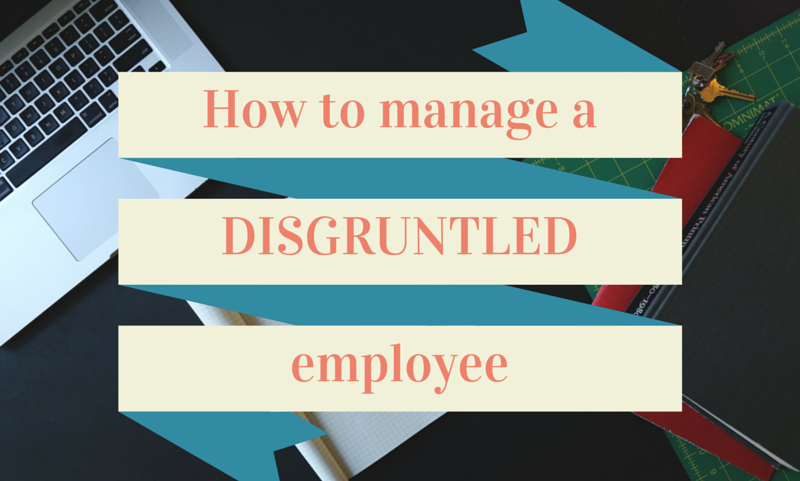 No matter the circumstances, your job as a manager is to deal with disgruntled employees. In this post, we’ll show you how. What Does It Mean To Be Disgruntled? The dictionary defines disgruntled as displeased and discontented; sulky; peevish. Eek. Doesn’t sound like a quality most managers want. When we have these employees in our workplaces, they’re detrimental to our company cultures. They spread negative energy, promote complaining, and encourage others to forget about getting things done. If others see that you permit employees to be disgruntled, they’re a lot more likely to become disgruntled themselves. It’s essential to nip these problems in the bud for the good of your company. Many managers ignore the obvious, tell-tale signs that employees aren’t motivated, or worse, about to quit. After all, it’s painful to see an unhappy employee under your change. Part of your job is sniffing out the signs, even if you don’t want to see them. How can you help a disgruntled employee if you don’t know they’re unhappy? Once you’ve determined you’ve got a disgruntled employee on your hands, you need to figure out why. Learning the reason is the only way you can fix the problem. There are many, many reasons employees can become unhappy– some may be directly related to the office, while others may have little to do with it. Some reasons are more problematic than others, but most are fixable, as long as you understand what the real problem is. To learn why an employee is unhappy, ask, and actually listen to their answers. This is a potentially stressful conversation, and we highly recommend reading Harvard Business Review’s Taking The Stress Out of Stressful Conversations before having a meeting about performance concerns. Employees often get defensive if you approach the topic wrong, and this resource has great suggestions for having a positive, game-changing conversation, even when it’s stressful. Once you’ve assessed what’s bothering the employee– whether it be a lack of challenge, a personal problem, or conflicts with colleagues– you’ll be better able to help. Don’t forget to document these conversations and their results so that you can cite them later, if need be. Are you providing a positive work environment for your employees? Maybe you think you are, but are you really? Usually, it takes two to tango, so it’s not helpful to blame the employee for their lack of productivity. Maybe they are struggling with productivity because they’re unclear on what your expectations are, or maybe they don’t have a good project management system in place. As a manager, you can change both of those things. But sometimes, it might be more about the employee than about the company and the systems you have in place. If you’ve worked to change everything, and the employee is still unmotivated, dissatisfied, and disgruntled, it might be time to let them go. Disgruntled employees make us angry. Here we are working our butts off, only to have an employee that can’t get anything done, and doesn’t seem to care. But we can’t let this anger and frustration get the best of us. OpenFORUM recommends five steps for managers dealing with these types of employees: Remain professional, don’t let it fester, keep it private, document everything, and don’t empower them. At the heart of OpenFORUM’s recommendations is professionalism. Don’t let the situation fester without doing anything– this doesn’t help anyone. Make sure to keep matters private so they don’t create extra gossip in the office. Document everything so that you can keep track of warnings, especially if you choose to fire the employee later. If you are able to listen and understand the problems an employee is having, and work with them to come up with real, game-changing solutions, you’ve done your job as a manager. Of course, there are strategies that can help you listen and understand better– don’t bombard an employee with questions. Ask one, and wait for an answer, even if you’re sitting in silence for a little while. You can come up with helpful solutions, too, by really getting at the heart of the matter. Try helping the employee set up a new task management software solution, a better calendar, or encourage them to work on a project with a colleague they really like. Put systems in place to help prevent them from falling through the cracks. If an employee can’t rise to the occasion after that, it might be time to think about letting them go. If an employee is causing you grief, you might have to make the difficult decision to let them go. At some point, the disadvantages will begin to outweigh the benefits, and it may be time to say goodbye. Firing is not easy to do, so make sure you’ve taken notes along the way, and that you’ve given the employee warnings about the consequences of their actions. It’s not fair to fire someone if you haven’t given them a chance to rise to the occasion. If you feel as though you’ve worked tirelessly to help, and it’s just not working out, it’s better for both to move on. Sometimes, a company just isn’t a great fit for an employee, and that employee isn’t a great fit for the company. Even the best company cultures have disgruntled employees, but it’s on you and your company’s leadership to build a culture that doesn’t have room for disgruntled employees. How to do this? Invest deeply in building out a company culture, creating values and a mission that prevent you from hiring these types of people in the first place. Values such as honesty, integrity, and generosity will quickly weed out employees who won’t fit in. Writing these values down will help you to assess prospective employees whenever you interview them. Don’t be afraid to fire disgruntled employees that show no signs of turning things around, either. This is your company we’re talking about– you want the best employees on the planet.